The use of recycled lumber has become an important part of sustainable building strategies in recent years. Many different applications can be devised for this type of material, ranging from reuse for the original purpose of the material to wholly unique applications. Using this material is never as straightforward a process as using new material. Here I will show the steps of converting recycled 1x4 tongue and groove fir flooring into a new traditional style porch floor for an older home. This shows the pile of material I selected at the salvage yard for the project. 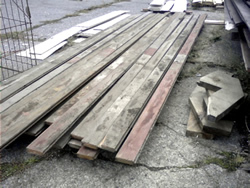 To see the project where this material becomes a new porch floor, see the Recycled Fir Porch page.